A delightful comedy, made in the unique and charming style of Frank Capra, “Mr. Deeds Goes to Town” is one of the most successful screwball comedies of all time, along with “It Happened One Night”, “You Can’t Take It With You”, and “My Man Godfrey”. You will see the handsome Gary Cooper in the role of the eccentric, funny, but also generous Longfellow Deeds, a tube player and a poet, who suddenly becomes a very wealthy man after he inherits a fortune from his deceased uncle. “The Cinderella Man”, as he is named by the local press, gets in all kinds of trouble when he moves to the big city. There he meets the love of his life, Babe Bennett, who turns out to be a reporter – the one who actually wrote some articles about his personal life and the one who called him “The Cinderella Man”. The story is not entirely funny. It also combines drama and romance with great skill, as Capra excels at this kind of plots. One of the writers was Robert Riskin, who made the screenplay for other Capra comedies, including “Meet John Doe”, bearing a resemblance to “Mr. Deeds”, again with Gary Cooper and co-starring Barbara Stanwyck. You will also like Jean Arthur’s performance as Babe Bennett. In fact, Arthur was one of the most prolific Hollywood stars of the 1930s, who unfortunately is very little known today. She also appeared in “You Can’t Take It With You” and “Mr. Smith Goes to Washington”, both productions of Frank Capra and with James Stewart in the leading role. All in all, you will certainly love “Mr. Deeds”, because it is a wonderful comedy. Frank Capra won the Oscar for Best Director, and the film got other four Oscar nominations, for Best Picture, Best Actor in a Leading Role, Best Writing, Screenplay, and Best Sound, Recording. There is something magical about all these movies made between 1934 and 1939, the period after the Great Depression and before WWII. They have a very pleasant atmosphere, they are very enjoyable, very entertaining, very elegant (lovely clothes and settings), and the actors, most of the times, have great chemistry, especially in the movies of Frank Capra, who was an expert at making good choices when it came to the cast – and crew. He usually offered the leading roles to certain actors whom he liked in particular, such as Barbara Stanwyck, Jean Arthur, Cary Grant, and James Stewart. I can only say, in the end, that I invite you to watch “Mr. 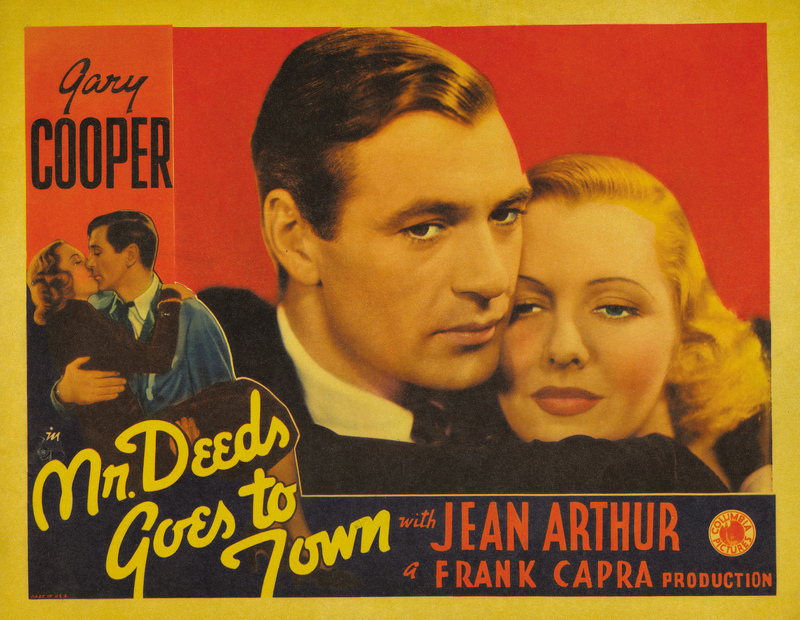 Deeds Goes to Town”, and any other Frank Capra films. As a matter of fact, starting from this week I will recommend many productions of Capra, aside from one of my favourites, “The Bitter Tea of General Yen”, on which I wrote an article several weeks ago.